With a host of world-class features, Zeiss Conquest rifle scopes cater to sportsmen and sportswomen who want the best performing hunting gear that money can buy. These scopes are outfitted for the serious hunter and are appropriate for a wide range of shooting and hunting applications. The Conquest V4 and Conquest V6 model scopes by Zeiss also offer a Limited Lifetime Transferable Warranty complete with a Five-Year No-Fault Policy, which means your investment in your scope is protected and you can rest easy. Whether you are an avid hunter or a weekend warrior, or a beginning hunter, you can’t find a better scope for most situations most will encounter out in the wilds. If you are looking for an exceptional scope that will surprise you, consider the Zeiss line of scopes to fill your needs. Popular and proven, these scopes are ideal for most hunters, and are available in many places, both online and offline. With several different models to choose from, the most difficult part of owning a Zeiss rifle scope is deciding which one is best for you. Then head for the woods, the game is calling you. Long recognized as a leader in hunting equipment, Zeiss has outperformed themselves with the new Conquest line of rifle scopes. 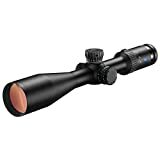 This scope is appropriate for hunting whether you are stalking game, sitting, or driven hunts. Long range applications are also widely in use by enthusiasts of Zeiss scopes. There are two basic models of Zeiss Conquest rifle scopes, the V$ and the V6. Each of them has their own unique features and capabilities, yet both of them are excellent choices for the hunter or sport shooter who wants a higher quality scope that meets their expectations. The conquest V4 family of scopes is based on a 4x zoom ration, with a 30-millimeter tube. Designed with second focal plane reticles, these scopes feature a large total elevation range and windage travel adjustments. Each of the V4 family delivers an eye to light ratio of 90%. The windage adjustments are capped, and click values are an MOA of 25. This model comes with windage turrets and capped elevation, standard. The Conquest V4: 4-16×44 and Conquest V4: 5-24×50 come with external elevation turrets. All external elevation turrets come complete with a ballistic stop that will conveniently return the scope to zero within any conditions. Reticle options include ZBR and ZMOA reticles, the newest style along with the more traditional plex-style reticles. The ZOAR reticle is an intelligent design based on Remington and Winchester ammunition ballistics. Some models have standard illuminated reticles. A magnification power throw lever is also available as an accessory. With this scope, a new standard in precision and long-range shooting has again been set. The 6x zoom Zeiss optics closes in on the subject with amazing accuracy. For use in any known scenario or conditions, this scope is sure to be impressive to any hunter. This scope is quick and has impeccable precision. The ¼ MOA click adjustments are helpful as well as the fine-tuned 80 clicks per rotation design for added precision. This line of scopes I offered in three different models, the Conquest V6 1.1-6×24, the Conquest V6 3-18×50, and the Conquest V6 5-30×50, all with varying available features. The T*lens, Lotutec and Fluoride glass lens coatings provide powerful view resolution and assure pinpoint accuracy. This scope is low profile, sleek and compact, and has a side parallax for which for some hunters is an advantage. Suitable for the demand of any rugged hunter or range shooter, you can depend on these scopes for any hunting situation you may encounter. The optics in these models of Zeiss scopes are industry leading, with a 92% light absorption ratio. Manufactured in Germany, Zeiss scopes are exceptionally well crafted with scientific sophistication that is difficult to duplicate. These scopes are made with precision mechanics and offer the best in what scopes can provide any kind of hunter, sporting flawless operation for years to come. All of the internal components are extremely reliable, so you don’t have to worry about your scopes performance when you are out in the field. Some models are made specifically for long range shooting, two specifically in the Conquest V6 line. With all the choices available here, evaluate your needs and learn more about scopes at our website, and when you are ready, get the Zeiss scope that best matches your specific needs.